This spirited couple purchased their residence with retirement in mind. They appreciated the disguised character of the home and understood its true potential, but needed our help to bring it all together. 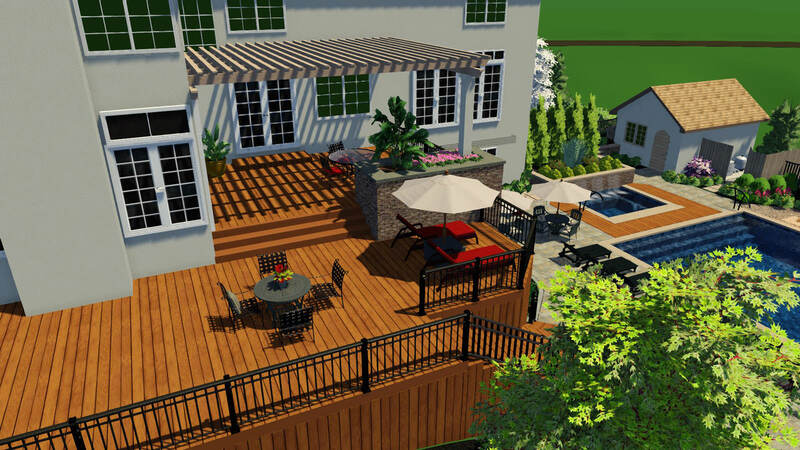 Follow along both phases of this MasterPLAN Outdoor Living journey, start to finish! 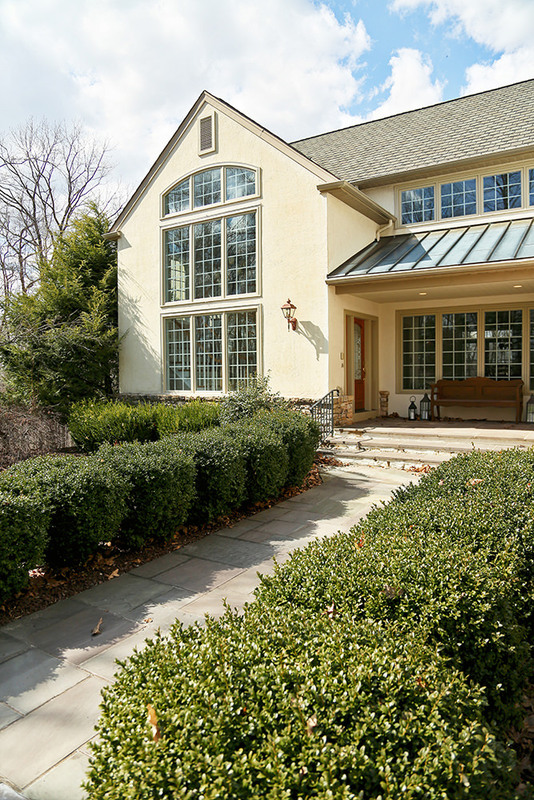 The existing landscaping didn’t do this beautiful home justice and made it feel very outdated. The previous patio space was failing and was not big enough for the new homeowners to entertain the way they wanted to. A home of this stature calls for a backyard that will truly amaze, and MasterPLAN was up to the challenge! The homeowners were floored when we showed them the first glimpse into their new landscape design! By building the deck up to the existing door thresholds, we were able to show this family the advantages of a seamless indoor to outdoor transition. 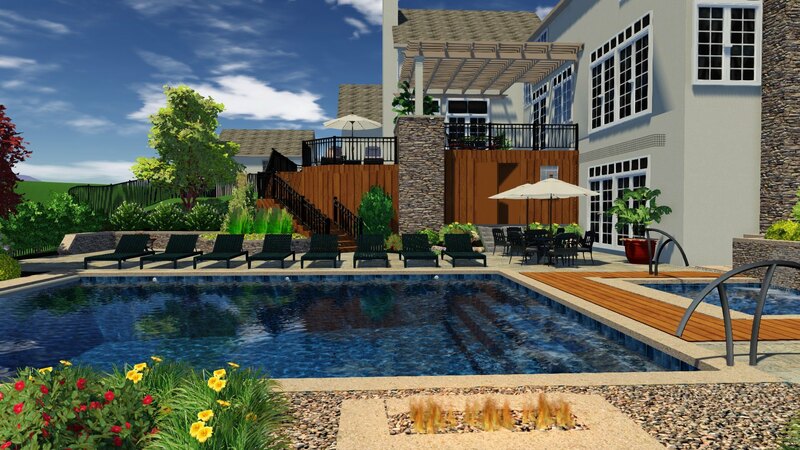 This 3D rendering makes us want to cannonball right into that water! We implemented the same Brazilian hardwood used to construct the main deck into the spa decking as one way to tie everything together. To say we were excited to start this deck transformation is a big understatement! 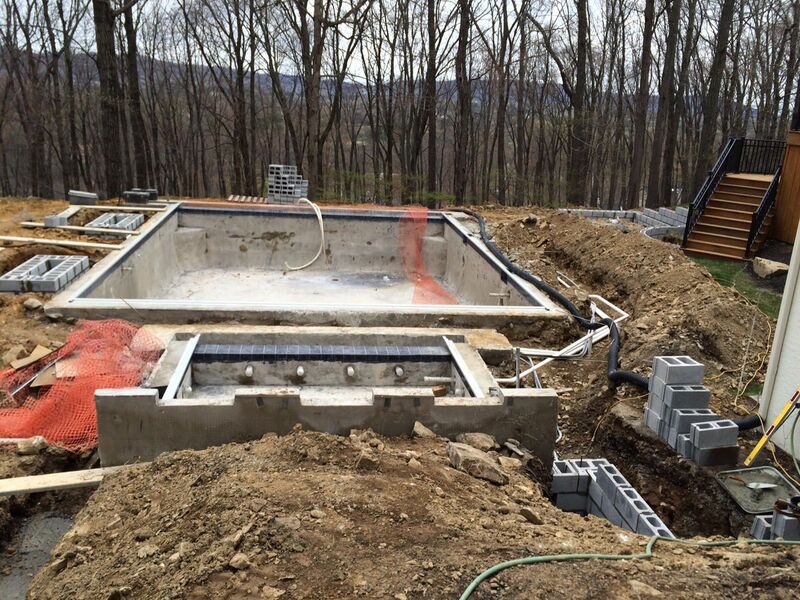 Once the gunite pool shell was in place, it was time to map out the rest of the surrounding features! Here, we can see the pool, spa and adjacent fire features starting to take shape! 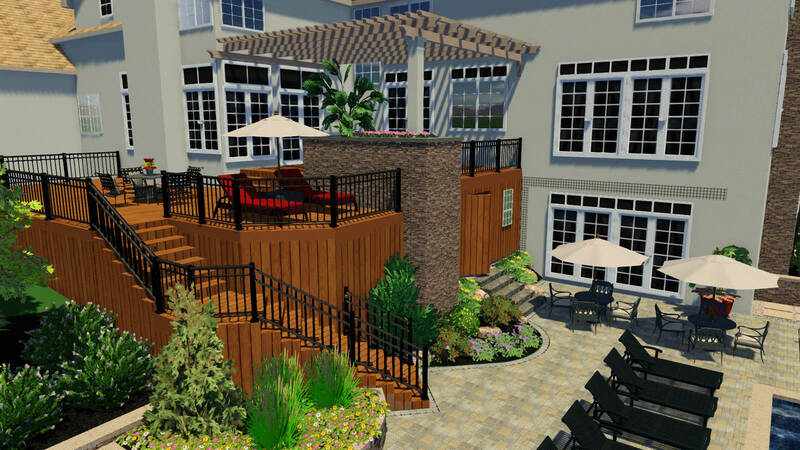 The homeowners were thrilled that the finished deck looked exactly like the 3D model they were shown weeks before. Absolutely stunning. The combination of stone, wood, metal and warm LED lighting makes this space come alive with timeless beauty. Greeted by a handcrafted gas lantern at the front of the walkway is our first glimpse into the detailed attention given to this landscape design. 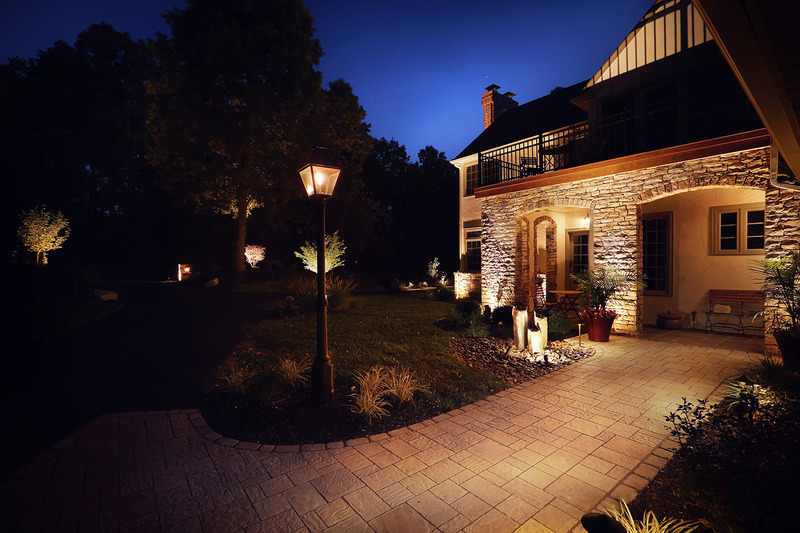 Soft and warm LED landscape lighting beautifully highlights the home and surrounding landscape features once the sun sets for the evening. Every material in this outdoor living space is cohesive to the home and perfectly compliments the existing architecture. It is our goal to make every project feel like it was built at the same time as the home. Earth, fire and water all combine to bring the hidden magnificence back to this property, creating the most outstanding oasis! The party doesn’t need to stop once the sun goes down! Out with the old, in with the new. The trees and shrubbery had grown into the home’s structure darkening the inside of the house and causing the outside to discolor. Clearing the overgrowth surrounding the home and grounds not only exposed the sophisticated charm of the property, it paved the way for us to re-define its brilliance. The original rear stone terraces were not ample enough for entertaining. We designed an expansive elevated living space using a warm Brazilian Cumaru hardwood. The homeowners needed more room for storage so we added an under deck storage space complete with inverted roof system to keep their items dry. In order to tie in with the beautiful stone in the front of the house, we added a hand chiseled stone raised planter, complete with palm trees for an added “vacation” touch. The space was brought together with a black fine textured aluminum rail. 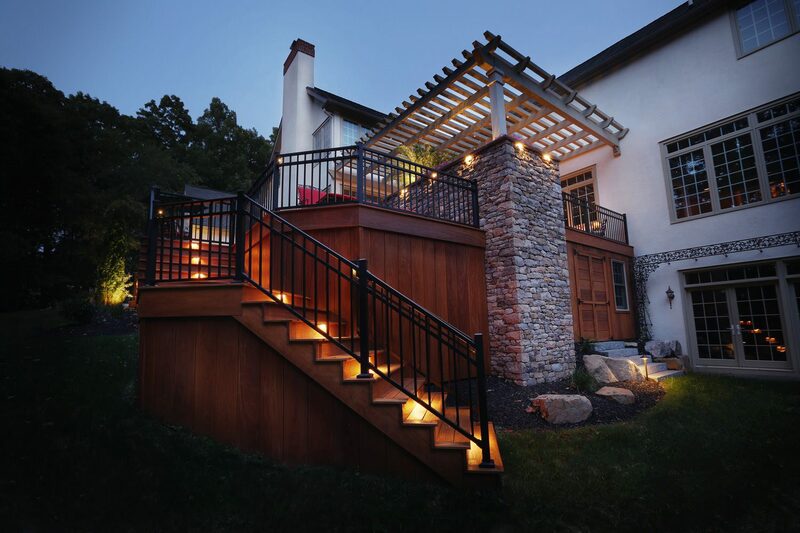 No outdoor space is complete without warm LED lighting. We incorporated them on the stairs, planters and even in the pergola to shine down like stars, lending a carefree al fresco feel. The old side entry was narrow, dim and uninviting. We installed a wider paver walkway, added a Bevelo handcrafted antiqued gas lantern, numerous LED lights that splashed against the stone and stucco, and a small Basalt spire water feature to create an inviting side entry. The macadam driveway was unattractive and not sufficient for turning around a vehicle so we added paver inlays and an apron affording the proper space. Decorative pavers were added to the center of the driveway to break up the macadam and expand the now welcoming front walkway and entrance. We created a 1 x 6 dog-eared cedar fence as a storage space for trashcans and to hide exposed utilities. Custom ornamental décor was fabricated not only for beauty but to hide the unsightly well casing. Lastly we removed the overgrown dull plantscapes and replaced them with beautiful, low maintenance plant selections for the owners to enjoy year-round color and texture. We were able to transform this home from an overgrown, inefficient, and dated design into a striking, functional, and timeless living space. 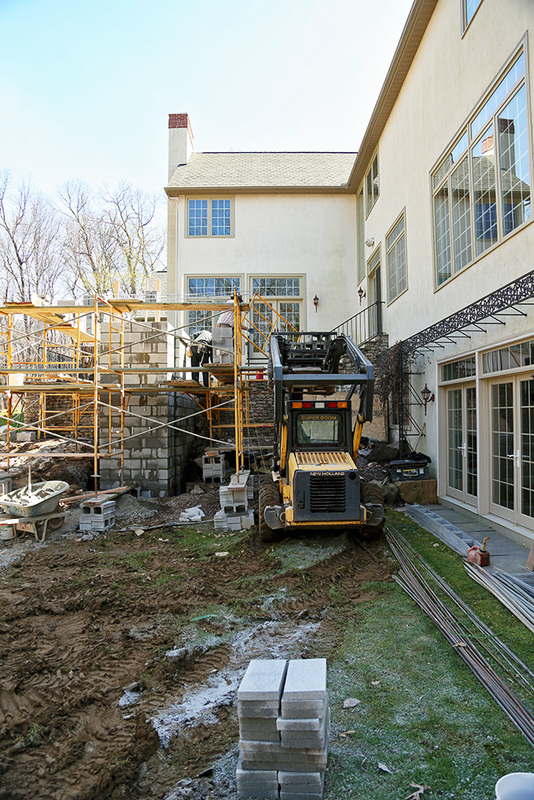 Now that the front entry and the rear deck have been constructed, we needed to address the backyard to complete the project and tie the property together. The homeowner wanted the backyard to be as inviting and functional as the rest of the home, incorporating several outdoor living elements. With this in mind, we wanted to create an engaging and beautiful entertainment space behind the home that felt relatively flat. This was very challenging, because the lot was anything but flat. A generous amount of fill had to be brought on this project to create an even topography. We integrated boulders and wildflowers in the back to help retain the soil, and keep the integrity of the hillside with a more natural look to go along with its function. With the yard at an even grade and the hillside supported and stabilized, it was time to start building the pool. The gunite concrete structure was designed to be geometric and function as an activities pool. The depth starts at 4’ and has a gradual transition to 5’ deep, which allows plenty of space for activities. Full spectrum LED lights illuminate this aquatic feature so the fun doesn’t have to stop once the sun goes down. The natural brownstone coping was used as the pool’s border, as well as the plaster and tile colors used in the pool itself were hand-picked to play off of the natural tones that are used throughout the whole project. To complete the pool installation, artistic handrails were installed for function and to help tie the metal elements from the nearby deck to the pool area. The pool was finished with an auto-cover in order to keep the stray leaves and branches out of the pool during the summer months. 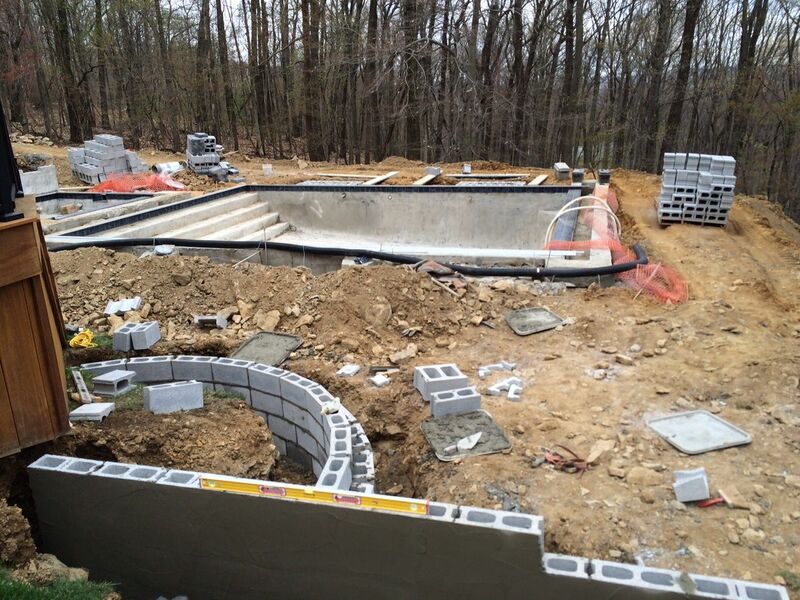 The adjacent built-in spa was also constructed of gunite concrete and incorporates the same tile work as the pool. This spa includes bench seating that wraps 360° and ample massage jets, providing generous room and bubbles for several guests to enjoy. 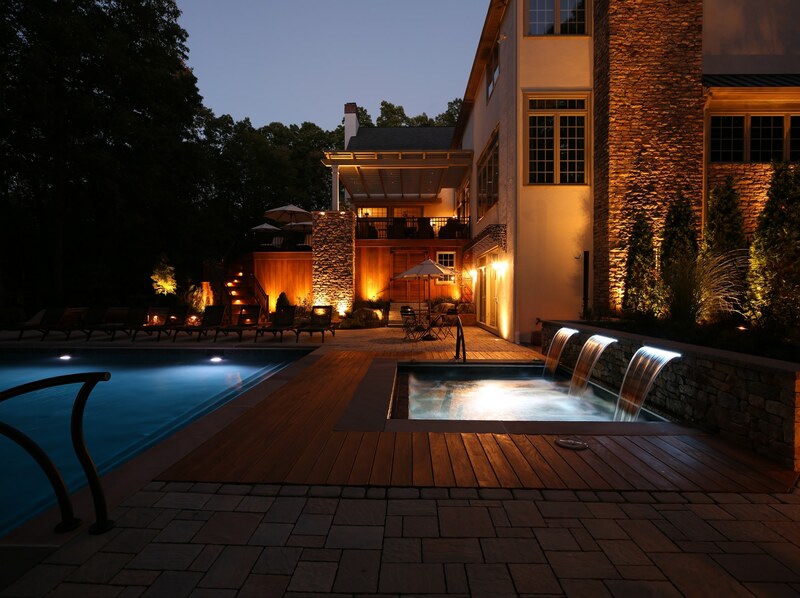 Three illuminated weir water features were integrated into the hand-chiseled full profile stone retaining wall, acting as the spa’s focal point. 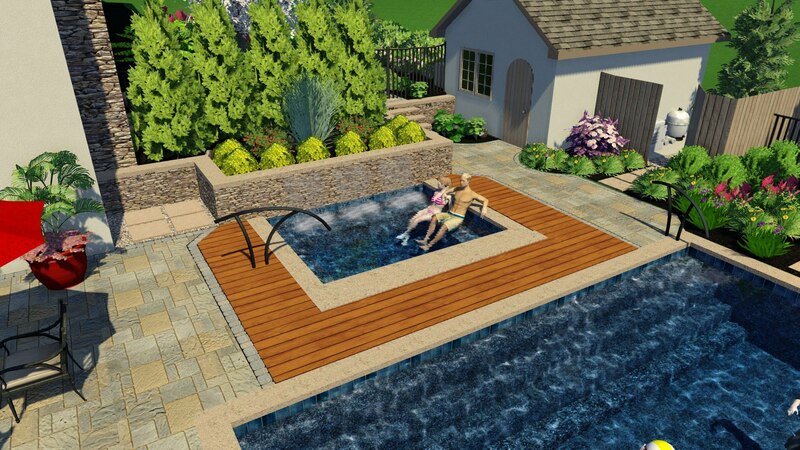 Just as the metal handrail for the pool tied into the deck railing, the spa is surrounded by ground level Cumaru decking, which is the same material used to construct the deck itself. An auto-cover was also installed for the spa to minimize the maintenance when not in use. A permeable paver patio was installed around the pool to allow plenty of space for walking, lounging and a cozy fire pit. 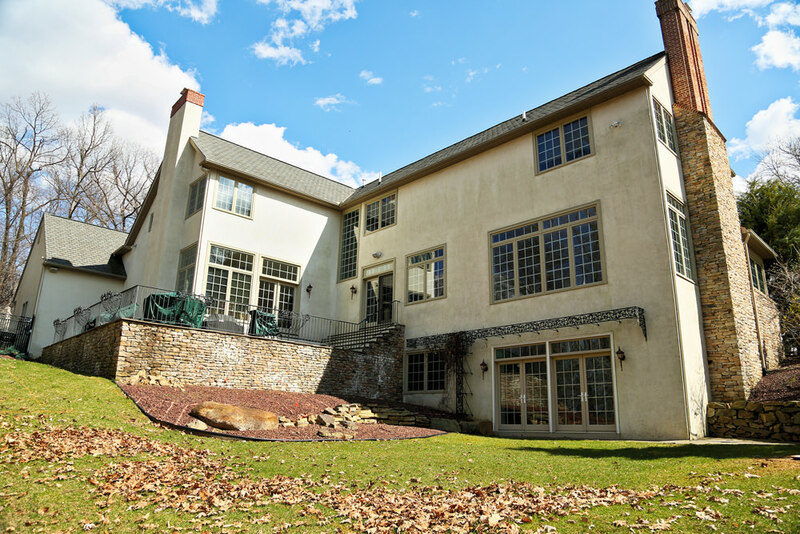 All of the retaining walls around the pool and spa area are footed masonry walls with full profile hand chiseled stone to match the deck’s stone structure and existing stone on the house. The goal behind this stonework was to keep consistent materials throughout the whole project, giving the feeling that everything was built all at the same time. Under cap lights were installed underneath a large portion of the retaining wall caps in order to cast warm LED light back to the patio for safety and aesthetics. Resting to the side of the pool is the pool house which was constructed to look like the existing home with matching shingles and stucco finish. This pool house creates an expansive space for storage, complete with an arch top doorway as an entrance and a full garage door in the back to allow access for larger equipment. Just beyond the pool house fence are two custom fire features, at grade level, that are constructed out of full masonry with a natural brownstone cap. The burners are covered with rolled volcanic stone to give the smooth impression of river rock. 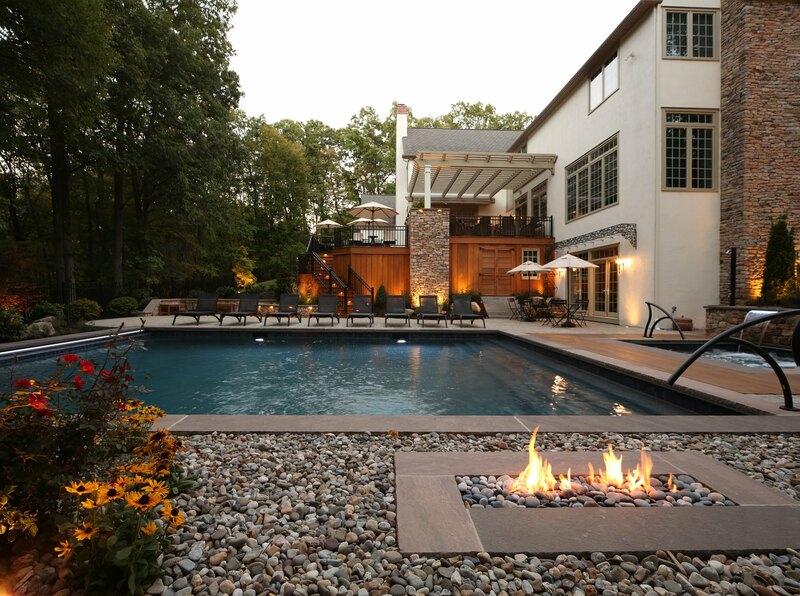 Theses fire features add a beautiful charm to the space, playing and reflecting off of the water of the pool. 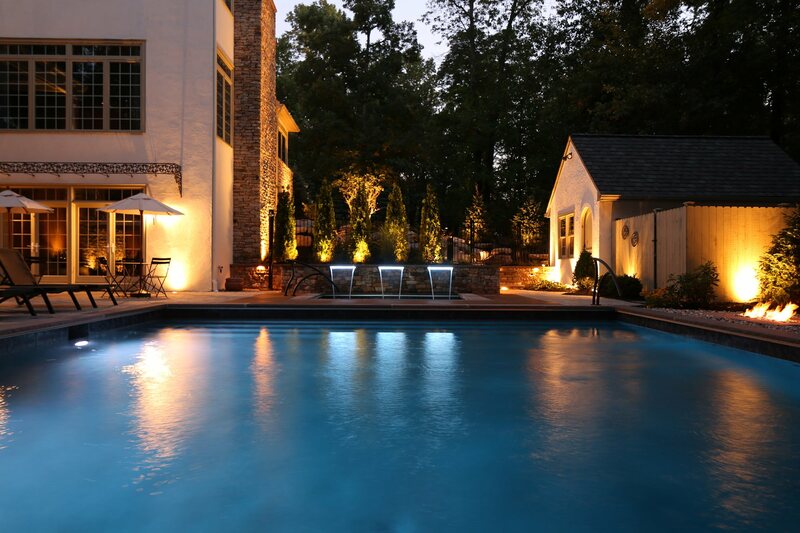 As an added bonus, all of the pool, spa, spa water features and fire features are controlled by the client’s iPhone. No matter where the clients are in the world, their backyard is always at their fingertips! The landscaping for this project needed to provide privacy from the street and create year-round interest. A variety of plantings were hand selected to display a lush green element to balance out the hardscapes. Flowering grasses were planted for texture and movement, perennials were planted for pops of color and evergreens were planted for year-round color and structure. 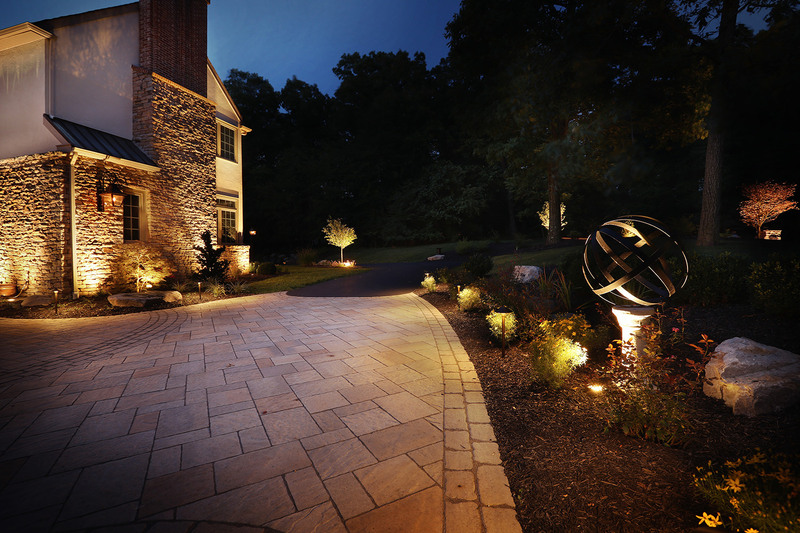 The LED landscape lighting produces visual impact and extends the evening so the client can entertain for as long as they would like. Within phase two of this project, we were able to take an uneven and lifeless open space and transform it into the magnetic backyard this client has always dreamed of by combining earth, water and fire elements to bring out its true potential. "One word - Amazing! Of the many companies we met with, MasterPLAN was the only one that had the enthusiasm and vision for the project. 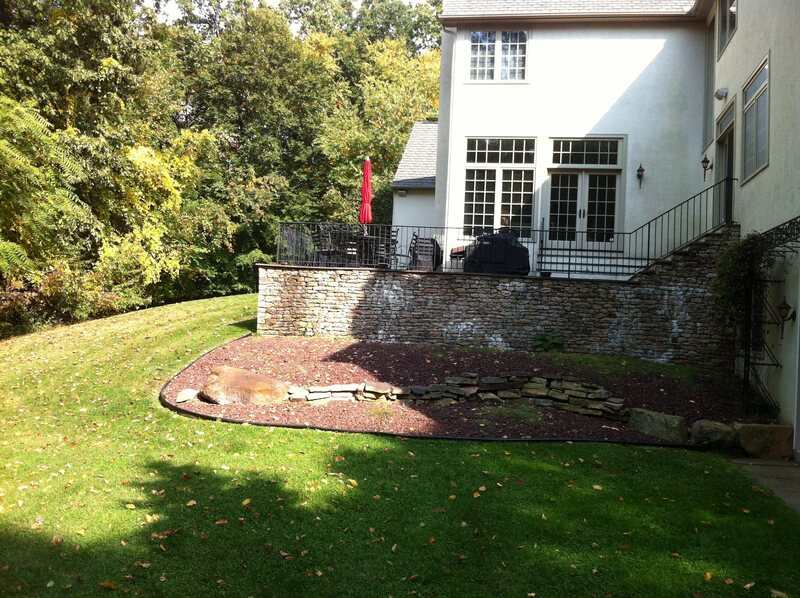 MasterPLAN is a professional landscape company that excels at both creativity and customer service!" “ONE WORD – AMAZING!! We contacted Josh at MasterPLAN after an extensive search for a landscape architect to design and refurbish the outside space at our new weekend home. Of the many companies we met with, MasterPLAN was the only one that had the enthusiasm and vision for the project. Josh really listened to us during our walk-about, asking a lot of questions to gain an understanding of what we were looking for. The virtual landscaping plan Josh developed is awesome, incorporating everything on our wish list in creative ways we had not considered. The digital program Josh uses gave us a real world representation of what our property would look like in both day and night. It also allowed us to take a virtual tour of our property to fine tune some of the details. The plan was very ambitious so Josh prepared a phased approach, over two years that kept our goals and budget at the forefront. Phase one began last spring and was a big project, which took about eight weeks. Josh was always available to answer questions and made plans to meet regularly with us on our schedule. Emails and voicemails were responded to with answers and resolutions. Any issues were resolved quickly and seamlessly. Even now, after the job is done, we continue to get a quick response to questions about maintenance. We were also doing a number of renovations inside and outside our home at the same time as this project and Josh worked seamlessly with our other contractor. The teams that Josh assembled to do the deck, the masonry work, and the landscaping, were all amazing in their work ethic and understanding of the project. They worked as one team and performed seamlessly with Josh keeping an eye on everything. Their attention to detail was impressive. Each day, they arrived early and went right to work. Josh was there to review what needed to be done and a couple of days he stayed and worked with the crew. 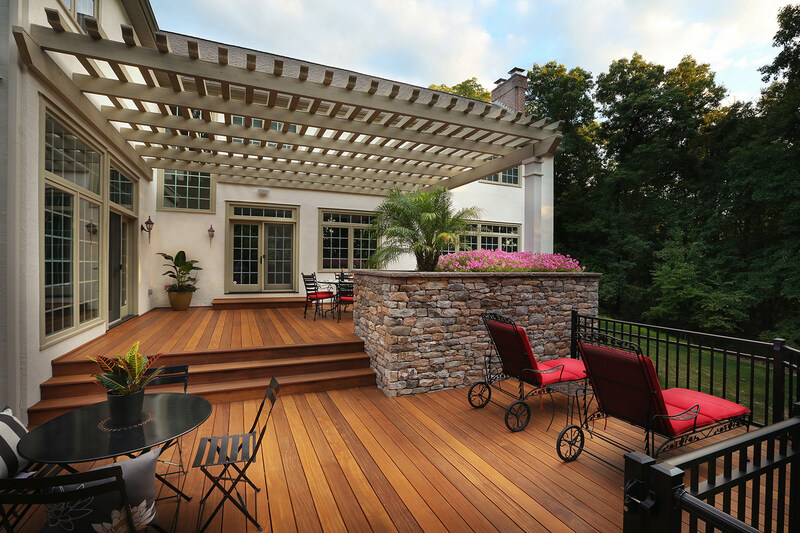 The deck they built, and the stone planter at its center, is beyond anything we had imagined! And the only thing that was more impressive than the deck is the lighting – our house looks amazing at night. Josh runs a tight ship. The job site was left neat and clean each day. Once demolition was complete, coming back each week we found a pristine yard, no matter what the stage of construction — equipment, including a couple of Bobcats, and tools neatly parked, stacked and lined up. All week we excitedly anticipated the progress and were never disappointed. The end result is breathtaking!